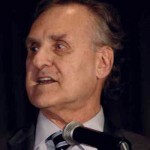 I had dinner with Stephen Lewis last night, me and 400 other folk who gathered to support development projects in Uganda at a dinner sponsored by Friends of Uganda, a Winnipeg-based group of individuals and organizations with strong ties to Uganda. Lewis is well known in Canada and abroad for his work on behalf of Africa, and in particular, the support his foundation gives to community-based organizations that are working against HIV/AIDS in Africa. A passionate orator who exudes wit, charm and a fierce commitment to social justice, Lewis spoke movingly for about 45 minutes on the enormous obstacles Africans confront and on the progress they are making. In a lighter vein, he reported on a recent trip to the Yukon where, he said, he too could see Russia. It was vintage Stephen Lewis. You can listen to his speech here. And perhaps when you are finished you will contact the Friends of Uganda to offer your help and/or financial support. Or visit the Ugandan Canadian Association of Manitoba for more information. Witty speech is so important in political speeches. I didn’t click on the link for the sppech because I knew if I started listening I could not stop and I do not have time right now. Many times I have been channel surfing and come across a Lewis speech and was just memorized by it. But it’s not just the delivery, it is the message. I too was at the Friends of Uganda Dinner with Stephen Lewis. Particularly interesting were his remarks about the disproportionately high impact of HIV AIDS on the women of Uganda. The prevalence of grandmothers raising orphans – with none of the supports or services available to the many grandmothers in similar circumstances in Canada – is shocking. That at least 1/3 of Mr. Lewis’ speech was devoted to this female dimension of the crisis reflects Mr. Lewis’ own overwhelming concern about the women of Uganda. Too bad the organizers don’t get it. That they did not see fit to deploy any African women on event night in roles other than singers and dancers was a slap in the face to David Lewis, the women of Uganda and black woman with origins in North America. I’m glad they raised lots of money. But, what a thoughtlessly wasted opportunity to present the point of view of the African woman from the African woman. Exclusion: another service Progressives provide. American Empire on the precipice? Let’s hope so.